Vil Ambu is about one such instance, where a couple of youngsters, each belonging to an upper class and lower middle class are residing in the same locality.These characters one being a Roughneck and an innocent person never meet from beginning till the end, but somehow they keep influencing each other. New Era youngsters will relate themselves with Actor Harish’s “Arul” character !! Father – Son relationship is emotional !! Presenting a story with multiple branches within 2hrs along with gripping screenplay is not an easy deal, Director Ramesh has succeeded. YogiBabu’s hilarious comedy counter’s are amazing, realistic laugh riot and it works out very well! This film is the best dual hero subject in recent time and the realistic screenplay will definitely keep Audience engaged. Last 20 mins of Vilambu is edge of the seat experience !! Don’t miss the never seen before screenplay Experience. Both the actors, Sri & Harish has given their best and these young talents should be used well in Tamil Cinema! Sri after Vazhaku en 18/9 has given a solid performance and Harish after Poriyazhan has given a stirring performance and looks handsome. Dual Hero Subject handled very well. First Half could have been better and trimmed a bit. 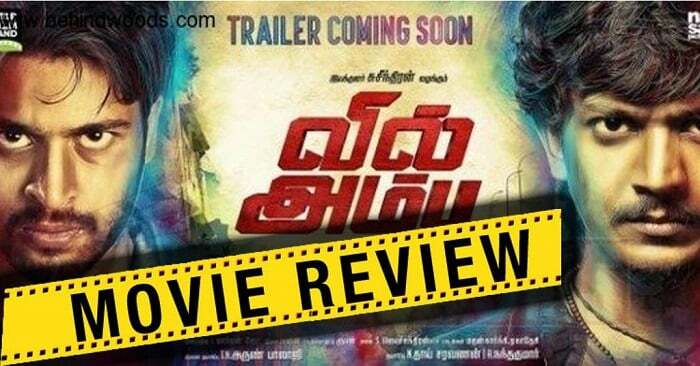 VERDICT: Vil Ambu – Pierces the target very easily. Go Enjoy in Theaters. Please dont review these kind of movies.Very worst movie .